Palestinian amora of the third and fourth amoraic generations (died about 350 C.E.). It is supposed that his colleague Ḥanina was his brother (Sanh. 14a; see Edels, "Ḥiddushe Agadot," ad loc.). They were lineal descendants from Eli the priest, which circumstance they assigned as reason for Johanan's failure to ordain them. For a living they plied the shoemaker's trade (see Hananiah [Ḥanina]). Hoshaiah and Ḥanina are mentioned in connection with a certain bath-house, the ownership of which was contested by two persons, one of whom turned over the property as "heḳdesh" (for sacred use), causing Hoshaiah, Ḥanina, and other rabbis to leave it (B. M. 6b). 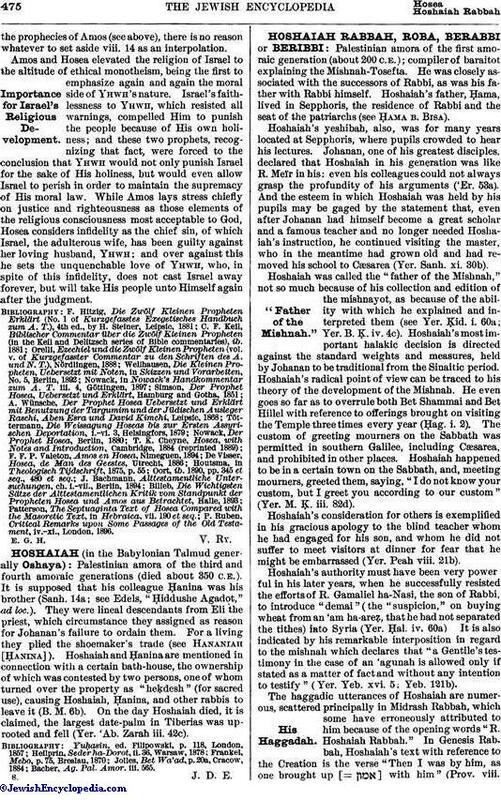 On the day Hoshaiah died, it is claimed, the largest date-palm in Tiberias was uprooted and fell (Yer. 'Ab. Zarah iii. 42c). Bacher, Ag. Pal. Amor. iii. 565.